Designing for a better connected world. Hello, my name is Lauren Hampton. I am a designer and studio artist. I've had the pleasure of working with companies from a variety of industries, producing work that delivers engaging visual experiences to help their businesses thrive. I am currently a product designer at Crew, and am always searching for that next great product to create or problem to solve. Crew is a new work app for teams that includes Messaging, Scheduling, Tasks and Recognition; making schedules, shifts and announcements available on everyone's phones at all times. Check out more of the work here. Prior to Crew, I helped shape the future of mobile security at Lookout. Lookout is a cybersecurity company based in San Francisco, CA and is a leader in both the enterprise and consumer mobile security space. 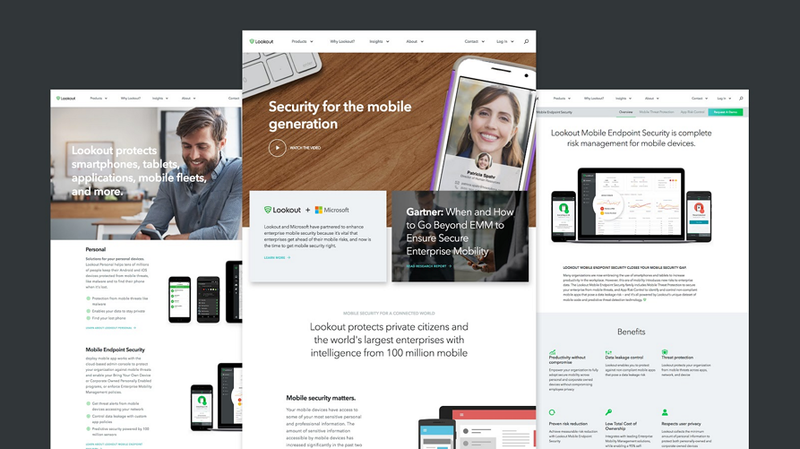 During my time with Lookout, our team designed and launched a brand new Lookout.com web experience, released a new identity & mobile threat protection security app for consumers, and introduced the world to Mobile Endpoint Security for the enterprise. Additional notable projects include serving as a creative partner for the 2013-2014 Idea Village New Orleans Entrepreneur Week, leading the design for the New Orlean's Startup Fund's national initiative, PowerMoves.NOLA, and working with many established brands including such notable companies as The Port of New Orleans, HighTail, Episcopal Collegiate School, and InnoGenomics, to name a few. Crew App is a new work app for teams that includes Messaging, Scheduling, Tasks and Recognition; making schedules, shifts and announcements available on everyone's phones at all times. We created a product style guide and component library in order to improve customer satisfaction & activation rate; aiming to build trust and add moments of delight while also solving discoverability issues thru IA improvements. Designing a new feature for Crew App: Gold star leaderboard. Gold stars improve employee engagement at work by increasing employee recognition. The gold star leaderboard creates a way for organizations to track and rank their awarded gold stars. Lookout is a cybersecurity company based in San Francisco, CA and is a leader in both the enterprise and consumer mobile security space. During my time with Lookout, our team designed and launched a brand new Lookout.com web experience, released a new identity & mobile threat protection security app for consumers, and introduced the world to Mobile Endpoint Security for the enterprise. Breaking things to make them better; hacking and innovating are in Lookout's DNA and are the skills upon which the company was founded. Each year, a company-wide hackathon is held in which employees from all departments can participate. My design team always had a blast creating the full employee experience; from creating the theme, to designing the artwork, all the way thru organizing the week's events. Event photography courtesy of Matt Wolfe and PowerMoves.NOLA. PowerMoves.NOLA launched alongside ESSENCE Festival™ in 2013 in New Orleans, Lousiana. The event gave some of the top minority entrepreneurs from all over the country the chance to pitch their ideas and showcase their talent. 2014 Entrepreneur Participants included Susty Party, Helios Digital Learning, Access Personal Finance and many more. We developed event materials that captured the spirit of New Orleans and the developing local entrepreneurial ecosystem. Updated the web scheduling experience + launched an Excel integration. I earned my Bachelor's Degree in Fine and Studio Arts from Rhodes College and polished my Visual Communication skills at Memphis College of Art and Design. I believe that in order to be an effective designer, one must be aware of emerging modern technologies and still remain mindful of the disciplines of traditional Studio Art. By utilizing my traditional Studio Art education, I aim to master my visual communication skills and produce effective design in a variety of mediums. The Episcopal Collegiate School: Jackson T. Stephens community in Little Rock, Arkansas offers education for grades Pre-K3 thru 12. With a core belief that knowing every child well will unleash the full potential in every child, Episcopal offers a challenging and excellent learning environment. The Episcopal brand reflects a collegiate style; taking a professional and formal approach. The process of creating a brand book started with a brand experience visual workshop and included reps from all departments. This helped us define our design attributes, voice, and tone. From there, we established our ideal customer experiences, defined our brand positioning and created a visual style guide to help unify our products across the board. Pet Holiday Card, "More Wag, Less Bark"
Original art now available for sale at Society6.com/scoutandbandit. I am based in California and have worked with clients from all over.